Mmmh, well there’s not much I can say really. The Dawn Patrol holds up quite well today, mostly thanks to some superb acting. The movie’s plot is pretty good, even though it’s been seen in a hundred other war films (maybe not before, but certainly since). As for action, there isn’t much of it, this being primarily a talk-driven film, but the big action sequence featuring Flynn and Niven’s characters bombarding a German airstrip is overly long and ultimately boring. Sure, they didn’t have the techniques and budget we enjoy today, and this representation is probably more realistic than cool-looking explosions with bombastic music, but it still is pretty boring. But once again, you don’t watch this film for the action. 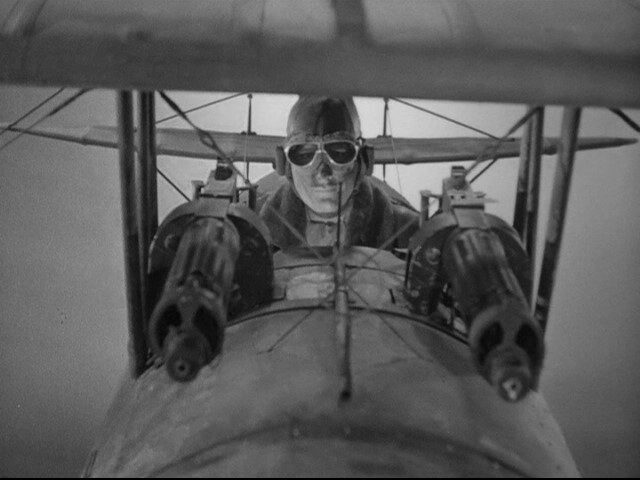 The Dawn Patrol is a classic war film that has aged very well indeed and features some truly wonderful actors doing a truly wonderful job. So while it isn’t a very impressive movie by today’s standard’s, it remains highly engrossing and a worthwhile viewing experience. Verdict: A brilliantly acted, efficient film. The Dawn Patrol holds a 7.6/10 on IMDB and isn’t rated on Rotten Tomatoes. This entry was posted in American Films, Movie Of The Day, Movie Trailers, Remakes, Videos, War Movies and tagged 1915, A Night At The Opera, Basil Rathbone, Dan Totheroh, David Niven, Edmund Goulding, Errol Flynn, Howard Hawks, Pete's Dragon, Royal Flying Corps, Scarface, Seton I. Miller, Sherlock Holmes, The Adventures Of Robin Hood, The Dawn Patrol, The Devil And Daniel Webster, The Guns Of Navarone, World War I by Mr Hollywood. Bookmark the permalink.